VDO Games have been developing the Cally's Caves series at least as early as 2013; while the original games were mobile only affairs, Cally's Caves 3 and Cally's Caves 4 found their way onto Steam in 2016 and 2017 respectively. On Steam, Cally's Caves 3 is critically successful with a "Very Positive" rating (84% of the 218 user reviews being positive) and since Cally's Caves 4 has been out for a couple of months now, it has managed to receive a Steam rating of "Positive" (100% of the 15 reviews being positive). 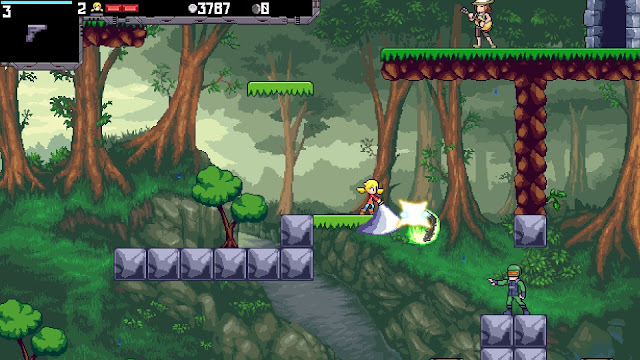 On the surface, Cally's Caves 4 looks like any other retro, 2D platformer out there and at its core, that's pretty much all it is. But the game does have lite-RPG elements to it, along with an arsenal of weapons, a multitude of characters, and a few modes besides the default game mode, which means it's packed with a bit more features than your run-of-the-mill platformer. Cally's Caves 4 is another game I received through Steam's Curator Connect, so thank you to VDO games for providing the review key. While I was hoping to review the game much sooner than this (as I received the key on 4 January), loyal readers know I prefer to finish games that I review which means if the game is more than a few hours long (which Cally's Caves 4 is) it can sometimes take a while. … except you're a girl, and you shoot football players. Don't worry, I'm sure they were bad football players or whatever. Anyway, my point is that Commander Keen is one of my favourite platformers of all time and since I'm getting the same vibe from this game, that can't be a bad thing. Like platformers of yesteryear, the game is less about performing ridiculous feats of agility using wall-jumps (urgh, I hate those things) and it's more about shooting enemies, clearing the level and collecting loot: that's my kind of platformer. You don't get to make a choice very often in Cally's Caves 4; in fact, I only recall the one time but it does have an impact on the game. I think it's really cool that someone has managed to incorporate that into a platformer. Mind you, I'm not setting the bar very high: to me, the typical platformer story is something akin to Super Mario, i.e. you have to save a princess in a castle. Well, you are saving the life of a friend in Cally's Caves 4 but there are a couple of points in the game where you're not quite sure who are the baddies and who are the goodies not to mention a big plot twist which meant I had no choice but to experience the New Game+ mode. Because I dig that kind of stuff 😊. While this is just a superficial addition (and one I didn't really care about since I ended up picking the default costume) you can choose to dress Cally in four different outfits. No, I didn't make a typo, there's actually a bear in this game called "Bera". Later in the game, you'll be able to play as Bera for some levels which is a welcome change of pace, since Bera's claws are pretty damn powerful. The game has 11 weapon classes you can level and every few levels they change in functionality slightly (e.g. faster fire rate, more bullets, different arc of fire, etc.). Examples of weapons you can acquire include the sniper rifle, flamethrower, rocket launcher and, my favourite, the discgun (this thing wreaks havoc when fully levelled). Not only that but once you've collected enough scrap you can then upgrade your weapons to do elemental damage or change their firing arcs. Once you finish the default game mode, there's New Game+ mode to play. While the levels are the same as before, new enemies are introduced in New Game+ mode and it's actually a continuation of the story, as opposed to just the same story but with harder versions of the same enemies. There's also a couple of other modes called "Survival" and "QWERTY" which gives you the opportunity to level up your weapons even further or collect loot in order to upgrade aforementioned weapons. The default game takes about 6-7 hours to complete but once you also play New Game+, that's over 14 hours of gameplay and that doesn't even include the other two game modes. Despite the game claiming to have only partial controller support on Steam, it ran seamlessly on my Logitech F710. The game has 72 Steam Achievements to earn although there are no Steam Trading Cards to collect. The game occasionally has framerate drops and I've found that it tends to happen when there are a lot of objects on the screen although at other times, it just seems random. When players of the game have complained about this issue, the developer has mentioned it's probably due to limitations with the GameMaker engine (which was used to develop the game). While the framerate drops are annoying at times, it doesn't adversely affect gameplay that badly. Cycling through the weapons is a bit of a chore. It would be better if you could quick switch to weapons like you can in FPSs using the number keys. Like most platformers, Cally's Caves 4 uses visible auto-save checkpoints only or "Type 2" according to my blog post on this riveting subject. Since the game isn't too challenging, it's not that big a deal but since the save points are scattered across the levels, you'll need to complete a few levels before you get to your next save point. 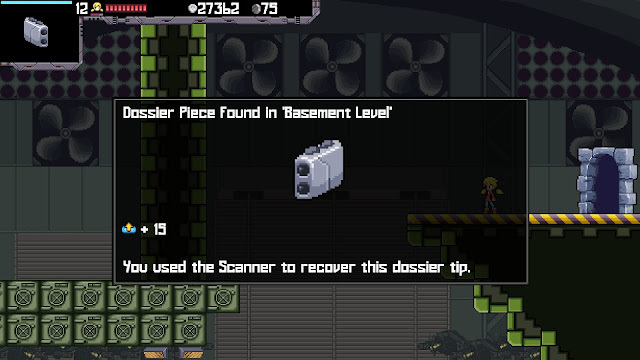 Whenever you use your scanner to unlock in-game lore/tips/information for your dossier they sometimes have typos. A minor complaint but a flaw nonetheless. 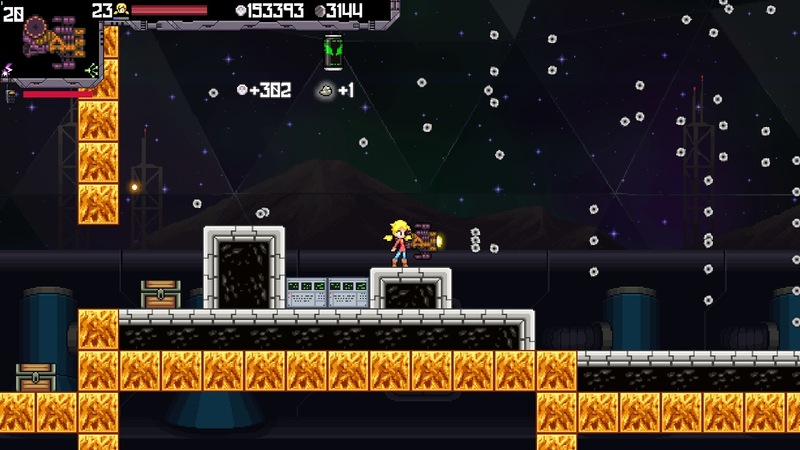 If you take a classic platformer like Commander Keen, give it a girl protagonist and then pumped it with the ability to level and modify your weapons, you'd be getting pretty close to what Cally's Caves 4 is all about; the game is that enjoyable that I was even motivated to play the New Game+ mode (and I never play New Game+ modes). The game does have minor issues with framerate drops, cumbersome weapon cycling and occasional typos but they're not severe enough to ruin the experience. Is the game worth $9.99 USD? : Yes. If you explore all the features the game has to offer, $10 USD (which is about $13 AUD) is not bad value (even better if you can get the game on sale).